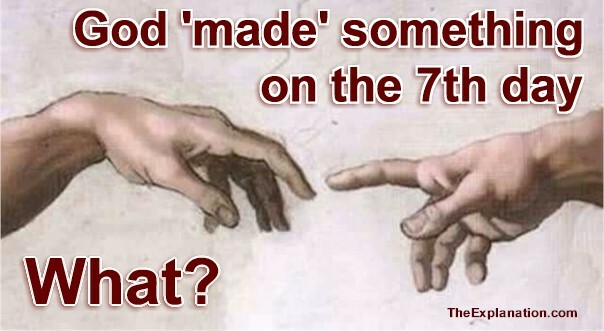 God made something on that 7th day of Creation week. What was it and how important is it? Come across this blog post for the first time? Please know that it is part of a larger work. To see the entire context, which you can read online, click here. In Gen 2.1, at the end of the 6th day it clearly states that all the creation was finished. Genesis 2.1 Thus the heavens and the earth were finished, and all the host of them. This means that all the ‘physical’, the animate (space, atmosphere, water, land, flora, fauna, life, human body, brain) and inanimate (mind) as I laid out in Inventory of the Universe, was indeed complete. As we look around we take note of our surroundings with all of our senses. This is the physical world that science has investigated extensively and attested both its microscopic minuteness and its immense grandeur. Pick up a National Geographic or Geo magazine and we are astounded by our Universe’s splendor, variety and intricacy. We’re going to see that although this physical creation was complete at the end of the sixth day there was still much yet to be accomplished. Adam, who was created that sixth day, spent a certain part of it naming the animals. As a plot twist, he has a part of himself removed, which becomes Eve, and then they spend a certain amount of time oogling over each other—put yourself in their shoes!—after which they both receive some instruction from God—and now it is sunset and the end of the sixth day. Here the Hebrew word ‘shabbat’ is translated rested (I’m color coding the English and Hebrew so you can see it … even if you can’t read it. You can also check UnlockBibleMeaning.com, find Gen. 2.3 and switch to the Interlinear Bible to see the word correspondence). From this term we have the word: ‘Sabbath’, known as the Jewish day of rest from Friday sunset to Saturday sunset. Galacti pulls out Strong’s Concordance for this next exploration. Remember, Strong’s Exhaustive Concordance of the Bible is our handheld help-tool for every word in the Bible, with all the root meanings and derivatives. If you’re not aware of this Bible help read up on it here. KJV – (cause to, let, make to) cease, celebrate, cause (make) to fail, keep (sabbath), suffer to be lacking, leave, put away (down), (make to) rest, rid, still, take away. KJV – cease, sit still, loss of time. The basic word means ‘rest’, but ‘in many implied relations’. In the course of seeing the full shape of this ‘Shabbat piece’ of the puzzle we’ll visit all these various translations and meanings. For now note 7674—from 7673—with the same 3 root letters—and one of these related meanings: ‘sit still’. We could say that God rested—sitting still. In modern Hebrew the word to sit uses the same 3 root letters; shin (שׁ), beit (ב), tuf (ת). He rested from all His work which God had ‘created’ and ‘made’. The word for ‘created’ is ‘bara’, a verb only used with God as the subject (see Further Study below). The ‘bara’ in Genesis is the creation ex nihilo (‘from nothing’—remember, just take it as a fairytale story if you like). I shall develop the creation story extensively in future blog posts and the book ‘Origin of the Universe‘ but for now we’re still focusing on God’s goal … the ‘why’ of the Bible story. 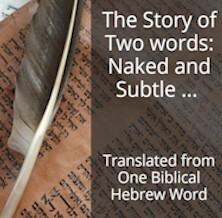 Let’s turn our attention to ‘made‘ from the original word ‘laasot’ and note a couple of points about the Hebrew text. The word ‘and’ is not present in Hebrew—it was added by the translators. In fact, one of my Hebrew teachers made this astute comment, “The sentence could easily have ended after the word ‘created’.” It could’ve, but it doesn’t because the verb ‘made’ adds a vital fundamental point, without which this puzzle piece loses its entire shape. Now notice below that in fact the word ‘made’ appears three times in verses 2-3. In Hebrew the first two renditions are ‘asa’—made in the past tense. The third rendition of ‘made’ is not in the past structure, it is ‘laasot‘—In English grammar we’d say this is an infinitive. I have no intention of giving grammatical explanations. All I will say is that an infinitive is a verb preceded by the particle ‘to’—That said, ‘laasot’ can be translated, ‘to do’. 2 And on the seventh day God ended his work which he had made (עָשָֽׂה); and he rested on the seventh day from all his work which he had made (עָשָֽׂה). 3 And God blessed the seventh day, and sanctified it: because that in it he had rested from all his work which God created and made (לַעֲשׂוֹת). When we put this all together we have God sitting, resting, having ceased (see this KJV translation and meaning of 7673 above) from the ex nihilo creation, but He is in the state or condition of ‘to do’ (6213), doing something. He is anything but idle during the 7th day. The six-day creation is finished but God is still diligent and busy. What occupation is He pursuing? What is He doing? What is He making? Check to see that in Genesis 2.3 ‘rested’ is indeed translated ‘ceased’ by the KJV translators in Strong’s 7673. Yes, I want you to double-check these points at the beginning of our journey because I want you to know I’m not giving you Sam Kneller’s translation of the Hebrew. The KJV translators were much better Hebrew scholars than I’ll ever be. ALL their various translations for the SAME Hebrew word give ALL the nuances and various meaning of each Hebrew word. As I conclude in the course ‘7 Keys to Master Biblical Hebrew’ … Each Hebrew Word, of and by itself, tells a story. We’re just beginning to get into these exciting stories. NB Remember that in Strong’s all the words following ‘KJV” (King James Version) are words used by the original translators to render ONE Hebrew word. You may want to revise this concept of multiple English translations for each Hebrew word that I’ve expanded here. Soon there will be a video course about the 7 Keys to Master Biblical Hebrew. A Study Method to Unlock Bible Meaning. As you’re beginning to see, that’s exactly what we’re doing in this blog post. And this is just an inkling of what we’ll be accomplishing. 8. This will display EVERY SINGLE USAGE of H1254 in the Old Testament in its contextual verse. 9. Read these verses to see that when it comes to ‘create – bara’ only God does this.